Start Battlefield 2 without changing anything. 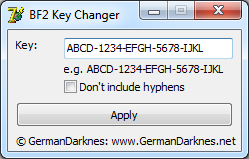 Start the CD-Key Changer, type in your CD-Key and press Apply. You have to run the tool as administrator! Run Battlefield 2 as Administrator. Try out if it works. If you still get the error, go back to Step 2 and tick the "Don't include hyphens" checkbox before pressing Apply.